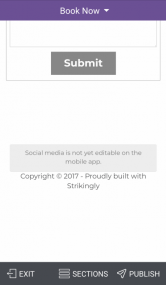 Strikingly's iOS app is free and you edit and create multiple free websites on the Strikingly sub-domain. There are several paid packages, but as with Jimdo, they only fully relate to Strikingly on desktop as only a few of the features are accessible via the app. 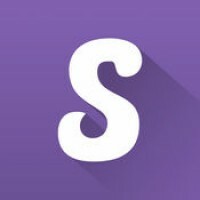 Creating an account on Strikingly is very easy. Just enter your email address and a password. You can also register with your Facebook or LinkedIn account. Just select a template and you're done. Strikingly is very user friendly: Menus are easy to find and easy to understand (there are only a few options in each menu). On the free version, the website has only a single page, organized in editable sections. The items you can add in a section are composed of a picture, a large font text field (for title), and a normal font text area. 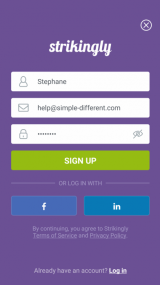 Contact, Content in Columns, Gallery, Sign-Up Form. • Inserting hypertext links is not supported. • Inserting videos is not supported. • Inserting dynamic maps (like Google Maps) is not supported. If you don’t have a computer, you might get stuck! Strinkingly for iPad has a few more functions than the iPhone app. You can change layouts, switch templates, change fonts and the colour scheme. If anything it is even easier to use (especially in portrait mode): when adding a new section, you have a clear idea of its layout before inserting it. 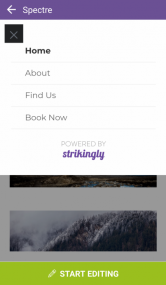 With the free version of Strikingly as well as the Limited package you can only create one-page sites. Strikingly has actually been designed to specialize in this kind of site and it is great at it. Sections of published pages load only when you scroll down, or when you select items in the menu, which scrolls to the different sections instead of opening new pages. The themes are well designed, as are the sections which you use to create your content. 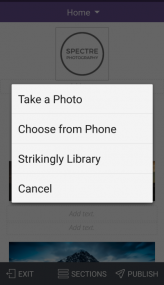 Not all of the styling and customization options are available in the app, though. Websites created with Strikingly look good on computers and phones. If you need more detailed statistics (and can access to a computer), you can even link your website to Google Analytics. The app is available in English, Catalan, French, German, Italian, Japanese, Portuguese, Simplified Chinese, Spanish and Traditional Chinese. You can create unlimited free sites from within the app and you can also clone sites, giving you an easy way to create multi-language sites. You would need to use the desktop version of Strikingly to properly link such sites together, however. 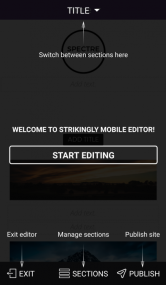 Strikingly app has a modern flat design and the in-context editing makes it a very intuitive content creation and editing process. While the app is loading, helpful tips are displayed on screen to explain the uses of the tools. Menus have a limited number of options and many buttons have labels as well as icons and are therefore easy to use and remember. 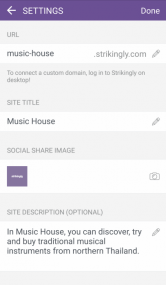 Strikingly on iOS is a thoughtfully created and useful assistant to Strikingly for desktop, but fewer than half of the capabilities of the website builder are available in the app. Even more is missing if you buy the paid packages, so you wouldn't consider these if you didn't have access to or didn't intend to use a computer. As explained above, Strikingly for iOS suffers from a serious lack of important features. The Android app also lacks many major features, but the computer version does not suffer from the same problems. Editing your website on an computer will not "break" anything and you can then continue editing on your iPhone. The iOS app is nevertheless best thought of and used as a companion app to the full-featured computer version. Strikingly's Help Center and FAQ provide many useful tips and advice. Starter videos get right to the point, but only talk about the computer version of the website builder. For serious issues, you can email the Strikingly Happiness Team! 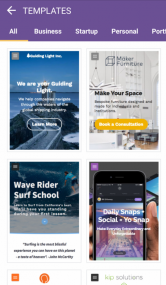 Strikingly's app makes beautiful one-page websites with a range of interesting templates, which look equally good on phones, tablets and computers. The editor, the in-app preview and the published website all render the same layout/template very faithfully, so that you don't really need to publish to see how your work will look on the web. Strikingly websites load fast. Title and description tags for Search Engine Optimization and social networks can be adjusted. Image alt tags can also be set. The buttons are great but not being able to set links on regular text is a drawback for creating content that search engines will notice. Another negative is that at least with the Free and Limited packages, Strikingly can only create one-page websites. There are many good uses of one-page sites, but a major drawback is in search engine visibility. There are also other SEO and social media features that have to be accessed on desktop. When you use Strikingly you edit right in the context of your website all the time. Even editing text doesn't take you to a separate editor window. This really helps you to focus on your content and move forward effectively. The Sections menu helps you organise your page into meaningful chunks of contents, and then change the order of these chunks if necessary. However, as with Jimdo, you will almost certainly need a feature that is only available in the desktop version and is not available in this otherwise promising app. The 2 stars then are a mark of how likely you are to finish the website only using the app.